Na Ceithre Cúirteanna le James Gandon, ar bhruach na Life i mBaile Átha Cliath. Is iad na Ceithre Cúirteanna an príomhshuíomh cúirte i bPoblacht na hÉireann, atá suite i mBaile Átha Cliath. Is iad na cúirteanna atá le fáil san fhoirgneamh inniu ná an Chúirt Uachtarach, an Ard-Chúirt, agus an Phríomh-Chúirt Choiriúil. B'é an t-ailtire iomráiteach James Gandon a dhear an áit, agus tógadh sna blianta ó 1796 go dtí 1802 í. Is iad na cúirteanna as ar ainmníodh an foirgneamh ná an tSeansaireacht, Binse an Rí, Cúirt an Státchiste agus Cúirt na bPléadálacha Comónta (Common Pleas as Béarla). Ag druidim chun deiridh don naoú haois déag, leasaíodh córas na gcúirteanna agus tháinig cinn nua in áit na gcúirteanna áirithe seo, ach níor athraíodh ainm stairiúil an fhoirgnimh. Nuair a bhain an chuid is mó d'Éirinn amach an rialtas dúchais mar Shaorstát, tháinig athrú nua ar chóras na gcúirteanna. Cuireadh sean-Ard-Chúirt na hÉireann ar ceal agus tugadh bata agus bóthar do Thiarna Príomh-Bhreitheamh na hÉireann agus do Thiarna Seansailéara na hÉireann. Ina n-áit sin, tháinig an Chúirt Uachtarach nua, agus an Príomh-Bhreitheamh i gceannas uirthi, chomh maith leis an Ard-Chúirt Bhreithiúnais, agus Uachtarán na hArd-Chúirte i gceannas uirthi. "The Scenery and Antiquities of Ireland". 1842. Joseph Stirling Coyne agus William Henry Bartlett. Bhí na Ceithre Cúirteanna i gcroílár na n-imeachtaí le linn Éirí Amach na Cásca, agus arís eile sa Chogadh Cathartha. Le linn an Éirí Amach, ghabh an Chéad Chathlán an foirgneamh faoi chomandracht Éamoinn Uí Dhálaigh. Tháinig an áit sách slán as an Éirí Amach, cé go ndearna gunnaí móra na nGall an-léirscrios sa phríomhchathair. Bhí an scéal i bhfad ní ba mheasa sa bhliain 1922, áfach, nó ba sna Cúirteanna seo a thosaigh an Cogadh Cathartha, go bunúsach. Nó nuair a tháinig scoilt ar Óglaigh na hÉireann i ndiaidh shíniú an Chonartha Angla-Éireannaigh, shealbhaigh Ruairí Ó Conchúir agus a chuid Óglach an foirgneamh seo, agus iad ag cur in aghaidh an Chonartha. Ar an 14 Aibreán 1922, gabh Ó Conchubhair agus timpeall 200 poblachtánach frith-Chonartha eile na Ceithre Cúirteanna agus roinnt foirgneamh eile, an Oifig Ballasta agus Halla na Máisiún ar Shráid Theach Laighean ina measc. Bhí Seán Lemass, a bhí ina Thaoiseach sna 1960í, ar duine de na hÓglaigh seo. Chuir gabhadh na bhfoirgneamh, a mhaireann thar thréimhse breis agus dhá mhí, le teannas idir na rannóga i Sinn Féin. Sa deireadh, ní raibh an dara suí sa bhuaile ag Mícheál Ó Coileáin ach an áit a ionsaí le ruaigeadh a chur ar na frith-Chonraitheoirí. Scriosadh an foirgneamh stairiúil faoi chith na sliogán, agus, thar aon rud eile, chuir pléasc mhillteanach sciathán thiar an fhoirgnimh de dhroim an domhain ar fad. Sa teagmháil seo, chuaigh sean-chartlann na dtaifead poiblí trí thine go hiomlán. Bhí sé ina ábhar conspóide ar feadh i bhfad, an raibh na frith-chonraitheoirí tar éis buamaí bobghaiste a fhágáil sa chartlann d'aon ogham. Dhiúltaigh siad don líomhain seo, áfach, agus iad ag áitiú nach bobghaiste a bhí ann, ach a gcuid lón cogaidh. Is fíor go raibh siad ag baint úsáide as an gcartlann mar stóras muinisin, ach ní raibh mianaigh d'aon chineál curtha ansin. Mar sin, madhmadh an muinisean de thimpiste le linn na gcathanna. Ar feadh deich mbliana i ndiaidh an Chogadh Chathartha, bhí na cúirteanna ab airde sa tír - an seanchóras go dtí an bhliain 1924, agus córas nua an tSaorstáit ina dhiaidh sin - lonnaithe i seanárasán an Leas-Rí i gCaisleán Bhaile Átha Cliath. 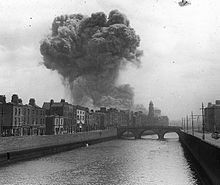 Sa bhliain 1932, hosclaíodh na Ceithre Chúirteanna arís, agus iad atógtha agus athchóirithe ó bhonn aníos. Mar sin féin, bhí trioc agus troscán an tseanfhoirgnimh caillte go deo, chomh maith leis na doiciméid, a chuaigh trí thine in éineacht le hOifig na dTaifead Poiblí. Thairis sin, ní raibh an stát úrbhunaithe sách saibhir le mórscéimeanna atógála agus athmhaisiúcháin a mhaoiniú. Mar sin, ní dhearnadh iarracht ar bith leis an tseanchuma a chur ar an taobh istigh den fhoirgneamh arís. hAtógadh dhá thaobhsciathán níb fhaide ar shiúl ón abhainn, nó roimhe sin, bhí sé ag cur isteach ar na daoine chomh cúng agus a bhí na cosáin lasmuigh den fhoirgneamh. Baineadh simléirí den fhoirgneamh freisin. Is féidir an locht a fháil ar na hathruithe seo, áfach, go ndearna siad dochar don dóigh ar phleanáil Gandon an foirgneamh sa bhliain 1796, agus don dóigh ar chóir dó dul i gcion ar an mbreathnóir, dar leis an ailtire. Tugadh an leathanach seo cothrom le dáta an 8 Aibreán 2018 ag 04:51.